He apologized. The only apology he's ever offered. And reading it again brought tears to my eyes, just as it did when I read it all those years ago, in a different house. In a different life. Mom, writer, lover of dirty martinis and dogs. It was in a box of things from our old house. William, my 13 year old, found it in the back of his closet. "Mom..." he startled me. I was in the kitchen, searching high and low for something gluten free that would taste just like spongy warm French bread (and having zero luck). "Mom. I found this in my closet. What is it?" He held out a notebook, one of those report cover things, with the clear plastic pages you fill with papers. 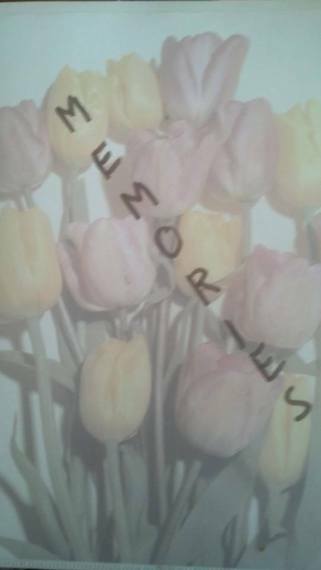 This one had a picture in the front pocket, a generic floral picture with the word MEMORIES handwritten across the front. It was a family history that was written up by my ex-husband's grandmother. It told the tale of his long-ago ancestors and their journey from Norway to the United States. A really cool thing, actually, with lots of old family photos, too. For a second I thought we should maybe give it to my ex, and then I thought, no. This is my children's history. They can keep it. William began looking through it, turning the pages slowly, seeing grainy black and white faces of long-ago children who shared some of his same DNA. He paused at one page, and pulled something out. "Uh, Mom... I think this is yours...", he said, and passed me a piece of paper. Oh my. I recalled folding that piece of paper and slipping it behind the picture, a lifetime ago. Or maybe it was only seven years ago. It was an email. I had printed it, and stuck it behind a picture of three chubby-faced Norwegian toddlers and then forgotten about it. Well, maybe "forgotten" is the wrong word. Like the sheet of paper it was printed on, I'd tucked the memory of this particular email behind other things in my mind. And there it had slept until William found it. The email was from my ex-husband, composed just six months before the divorce was finalized. He'd written it after we'd attended his sister's wedding, arriving apart but spending a good deal of the evening together, with all four of the kids. Apparently, it had triggered some big feelings, which prompted him to write this brief but telling note to me on a Monday night in June 2006. It was painful to read. It hurt when I'd read it back then, and reading it in 2014 exhumed some of that old, dusty anguish. But this time, it also made me feel something better than hurt. Something positive, and ultimately, something healing. There was one line in that email that did it for me. No, it wasn't the number of times he said "sorry" (five). It wasn't his admission that he'd turned to the wrong person when he first started having doubts about our relationship. It wasn't even the part where he said that as he watched me, smiling and talking to his family at the wedding, he realized how much he'd messed things up. It was one little sentence. Six words that packed a powerful punch. He said that he had chickened out... and that I never did. When a spouse walks away from a marriage, the one left behind often tries their damnedest to turn it around. We try to fix things, even though most of us are keenly aware that the damage done is too deep to ever repair. We end up wondering if fighting for it was a dumb idea, a waste of precious time and energy. Reading these words from the past, this acknowledgment from my ex, let me know that it wasn't a waste of anything. It was indeed worth fighting for, even if it ended up being a losing battle. I'm glad William found that book in the back of his closet. I needed reminding. Life has once again presented me with some obstacles, and I've been feeling small and afraid. It was important for me to see those words, no matter that they were written by my ex-husband several years ago. When faced with a challenge, be it a wounded marriage or a job loss or anything else that seems too big, too scary to deal with: dig in your heels and fight. Fight for what you believe in, even if it is a David vs Goliath confrontation. Regardless of the outcome, you will know that you did the right thing. And it won't go unnoticed. You will stand on that battlefield, bloodied and bent and yes, maybe defeated. But you'll know you went down swinging. I'd like to think that I slipped that folded note into that book, that particular book, for a reason. Maybe I knew I'd need to read it again, some day in the future. Maybe it was because I needed a physical, touchable piece of my own history, something I could hold in my hands and read with my eyes instead of just feeling it in my heart or revisiting it in my mind. I put it in a book titled "Memories". Because that's what it is now.